As I’ve mentioned here before, I’m a Star Trek fan. But not so big that I would attend the annual Creation Star Trek Convention in Las Vegas (or even notice an article about it until months later). But notice it today I did. Trekkers at the convention attempted to rank all the movies in the franchise from best to worst. It’s no surprise that Star Trek II Wrath of Khan topped the list, and even less that the most recent Star Trek Into Darkness landed at the bottom. After all, these are the most rabid fans. And the movie these Trekkers placed in the #7 slot? 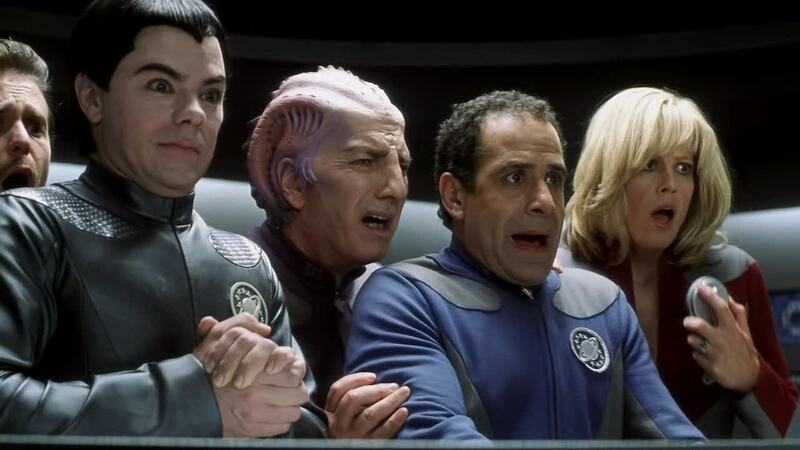 Galaxy Quest, a hilarious 1999 send-up of the series and its fan base. During the convention, Quest held the #1 and #2 spots early in the voting before slipping to the halfway mark to split the other 12 Star Trek movies. Makes me like these geeks even more! This entry was posted in Entertainment, Humor, Internet, Movies and tagged by Grabthar's hammer, Creation Star Trek Convention, entertainment, fan base, Galaxy Quest, geeks, Humor, Internet, Las Vegas, movie franchise, Movies, parody, rabid fan, sci-fi, science fiction, send-up, Star Trek, Star Trek II Wrath of Khan, Star Trek Into Darkness, Star Trek movies, Trekker, voting. Bookmark the permalink. That movie is a masterpiece! Trekkers have chosen wisely.